Last week we reported that the President withheld his assent to the Petroleum Industry Governance Bill (PIGB). At the time of our report, the news coverage had focused on the President rejecting the Bill because it “whittled down his powers.” Since then, there have been various reports on the refusal of the President to assent to the first of four bills seeking to reform the Nigerian oil and gas industry. We review some of these reports here. The Presidency’s position enunciated above suggests that the PIGB is not dead and may be revived by addressing some of the concerns raised. This article by Victoria Ohaeri & Samuel Diminas analyses the reasons given by the Presidency for refusing assent to the PIGB. In our view, addressing the funding of the NPRC is critical. An independent regulator needs independent means of funding so that it is not subject to capture by the private sector that it is regulating or the government on whose behalf it is regulating. With respect, the arguments above are based on an erroneous equation of Nigeria and NNPC’s interests. Nigeria derives its right to the oil in the ground from the provisions of the Constitution and the Petroleum Act. Based on this constitutional right, the Minister is empowered by the Petroleum Act to license the right to explore and produce petroleum to other entities. NNPC is merely a licensee of the government like Total, Shell, Sapetro & Oando. Therefore the (partial) privatisation of NNPC cannot equate to the sale of the Federal Government’s rights to oil. Furthermore, a large proportion of the income generated by the government from the oil and gas industry is through tax and royalty. 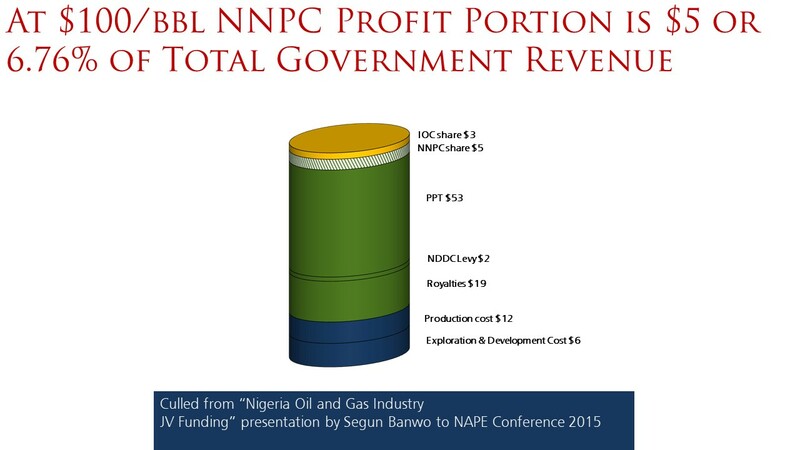 Indeed as the figure below shows even in a US$ 100/bbl world, NNPC’s proportion of total government revenue is less than 7%. Thus, the (partial) privatisation of NNPC or its successor companies will not have the consequences on government revenue or control as predicted by the respected analysts above. Indeed, we argue that without partial privatisation, the successes of any reforms to the national oil company will be extremely limited. A major cause of the problems which have plagued NNPC over the years has been the inordinate control exercised by political figures. If the state continues to exercise full ownership, these controls will not abate and the inefficiencies and waste associated with them will continue. NPRC funding – either reduce the percentage of revenue that may be used in funding the NPRC to a figure more acceptable to the government or find another means of providing independent funding to the regulator. One method used in other countries is to levy the industry being regulated. PEF issues – this may be resolved by removing the provisions on PEF from the Bill. We do not consider those provisions fundamental to the objectives of the Bill. Alternatively, the Executive may propose the amendments it considers necessary to ensure that the provisions are aligned with its policies. Drafting considerations – the Executive should propose its changes for the consideration of the National Assembly.